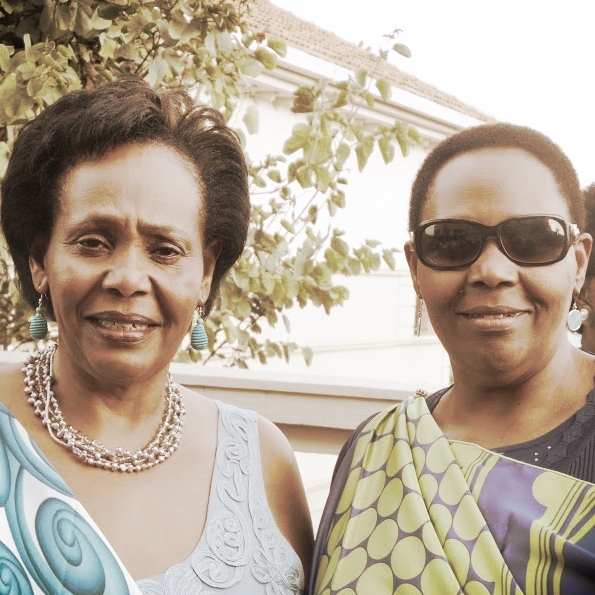 Joy Ndungutse and Janet Nkubana, co-founded Gahaya Links Cooperatives shortly after the Rwandan genocide ended in 1994. These inspiring sisters had a vision to turn ancient basket weaving skills into a source of livelihood for thousands of rural women. Many of the women, like Janet and Joy themselves, were returning refugees or survivors of the genocide. The women started weaving baskets in exchange for food. Initially bringing together about twenty women, the sisters taught them how to weave and how to enhance their weaving skills with new design techniques. Today, Gahaya Links manages a network of over 4,000 weavers across the country, organised into around 72 cooperatives that help provide much needed income and stability. The sisters have successfully opened the business to international markets, partnering with the likes of Macy’s, Walmart, Oprah Magazine, Anthropologie, Crate & Barrel, and Kate Spade. Today, Gahaya Links "Peace Baskets” are sold and admired the world over. In November 1994, Janet Nkubana returned home to Rwanda having been in exile as a refugee in Uganda. She was running a hotel in Rwanda’s capital Kigali and kept noticing all the women hawking baskets in front of her hotel. Her first instinct was to convince them to move their business elsewhere as she felt they were pestering her clients for sales. Yet, she noticed that her hotel guests were among the few people with money to spend and the main source of sales revenue for these women. She approached the women and told them she would set up a shop in the hotel itself to sell the baskets directly to hotel guests, and added that she would also take their baskets to sell at flea markets when visiting her sister, Joy, who lived in the United States. What's Gahaya Links all about? Gahaya Links is for-profit Rwandan handicraft company based on the simple principle of women economic empowerment through fair-trade. "The vision of Gahaya Links is to empower rural communities to become entrepreneurs and earn better incomes to live with dignity among their communities." The Agaseke is Rwanda's oldest traditional basket now called the "Peace Basket" a symbol of unity. Gahaya Links success is based on traditional weaving techniques to empower the women of Rwanda and the country's socioeconomic development. Today Gahaya Links is a growing network of over 4,000 weavers across the country organized in 52 savings cooperatives. If there is one women-led, African social entreprise that springs to mind when we speak about the power of collaboration, it has to be Gahaya Links in Rwanda. The brainchild of sisters Joy Ndungutse and Janet Nkubana, this for-profit Rwandan handicraft company founded on the simple principle of women economic empowerment through fair-trade, is this month celebrating a decade-long partnership with the prestigious Macy’s retail group in the US, called the Rwanda Path to Peace initiative. Joy Ndungutse the co-founder of Gahaya Links in Rwanda has been recognised with the prestigious Artisan Hero Award 2015 by the Alliance for Artisan Enterprise, Aspen Global Health and Development, and The Aspen Institute. She was recognised for her wonderful work in creating an artisan-based, social enterprise that had a vision to turn ancient basket weaving skills into a source of livelihood for thousands of rural women. Congratulations to Joy, her sister and co-founder, Janet, and all the wonderful artisans who make up this inspirational co-operative, artisan project. Janet Nkubana is co-founder of Gahaya links, a company that has empowered and supported Rwandan women through job creation. Nkubana's company is committed to restoring hope and dignity of women who were affected by the 1994 genocide against the Tutsi. From a humble beginning under a tree in the remote village of Byimana in the Southern Province, Gahaya Links started organizing women in associations that were later transformed into cooperatives. Inside the Gahaya Links workshop on the outskirts of Kigali, Rwanda's capital, a group of women sit side by side against a brightly-painted wall. Using natural fibers and grasses, they pool their weaving skills to create exquisite hand-made baskets, inspired by the eastern African country's art and tradition. "Public Relations is key to any initiative, not only business initiatives... (to) implement any idea you have – talk about it. Be free and say what you think, share what you want to achieve. Use the partnerships and nurture them." 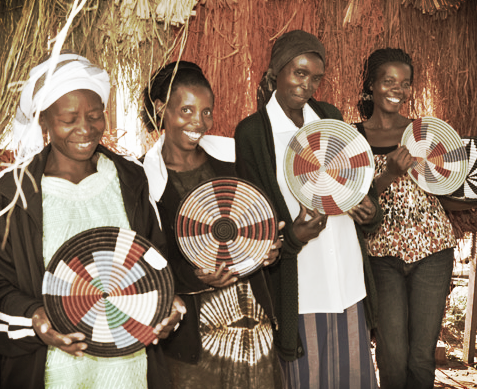 Walmart and Full Circle Exchange connect shoppers with quality products made by the network of women basket weavers in Rwanda, allowing customers to help the lives of their families and communities. Gahaya Links is for-profit Rwandan handicraft company based on the simple principle of women economic empowerment through fair-trade. "The vision of Gahaya Links is to empower rural communities to become entrepreneurs and earn better incomes to live with dignity among their communities." - Joy Ndungutse and Janet Nkubana, co-founded Gahaya Links Cooperatives shortly after the Rwandan genocide ended in 1994. These inspiring sisters had a vision to turn ancient basket weaving skills into a source of livelihood for thousands of rural women. Many of the women, like Janet and Joy themselves, were returning refugees or survivors of the genocide. The women started weaving baskets in exchange for food. Initially bringing together about twenty women, the sisters taught them how to weave and how to enhance their weaving skills with new design techniques. Today, Gahaya Links manages a network of over 5,000 weavers across the country, organised into around 52 cooperatives that help provide much needed income and stability. The sisters have successfully opened the business to international markets, partnering with the likes of Macy’s, Walmart, Oprah Magazine, and Kate Spade. Today, Gahaya Links "Peace Baskets” are sold and admired the world over. "We take pride in the fact that we are a socially responsible firm and believe that giving back to our community and sharing our wealth of knowledge and experience is the only way of building a healthy and economically sound future." - Janet Nkubana, co-founded Gahaya Links Cooperatives with her sister Joy Ndungutse shortly after the Rwandan genocide ended in 1994. These inspiring sisters had a vision to turn ancient basket weaving skills into a source of livelihood for thousands of rural women. Many of the women, like Janet and Joy themselves, were returning refugees or survivors of the genocide. Today, Gahaya Links manages a network of over 4,000 weavers across the country, organised into around 52 cooperatives that help provide much needed income and stability. The sisters have successfully opened the business to international markets, partnering with the likes of Macy’s, Walmart, Oprah Magazine, and Kate Spade. Today, Gahaya Links "Peace Baskets” are sold and admired the world over. "Something small can create an impact, .... You don’t have to have a lot of money to start a business. You can start small, but you must have a passion for what you’re doing." - Joy Ndungutse and Janet Nkubana, co-founded Gahaya Links Cooperatives shortly after the Rwandan genocide ended in 1994. These inspiring sisters had a vision to turn ancient basket weaving skills into a source of livelihood for thousands of rural women. Many of the women, like Janet and Joy themselves, were returning refugees or survivors of the genocide. The women started weaving baskets in exchange for food. Initially bringing together about twenty women, the sisters taught them how to weave and how to enhance their weaving skills with new design techniques. Today Gahaya Links has grown to include over 5,000 women weavers in 52 different cooperatives across Rwanda, providing much needed income and stability. The sisters have successfully opened the business to international markets, partnering with the likes of Macy’s, Walmart, Oprah Magazine, and Kate Spade. Today, Gahaya Links "Peace Baskets” are sold and admired the world over. - Janet Nkubana co-founded Gahaya Links Cooperatives with her sister Joy Ndungutse shortly after the Rwandan genocide ended in 1994. These inspiring sisters had a vision to turn ancient basket weaving skills into a source of livelihood for thousands of rural women. Many of the women, like Janet and Joy themselves, were returning refugees or survivors of the genocide. The women started weaving baskets in exchange for food. Initially bringing together about twenty women, the sisters taught them how to weave and how to enhance their weaving skills with new design techniques. Today, Gahaya Links manages a network of over 4,000 weavers across the country, organised into around 72 cooperatives that help provide much needed income and stability. The sisters have successfully opened the business to international markets, partnering with the likes of Macy’s, Walmart, Oprah Magazine, Anthropologie, Crate & Barrel, and Kate Spade. Today, Gahaya Links "Peace Baskets” are sold and admired the world over. "In our weaving groups we have women who survived genocide, we have women who have husbands in prison, we have girls who lost everyone who are heading households. Through weaving we manage to have everyone under one roof sharing and working together." In the aftermath of the 1994 Rwandan genocide, with thousands of families decimated, and many Rwandans left to fend for themselves, two intrepid sisters Janet Nkubana and Joy Ndungutse devised a way to help women become self-reliant. 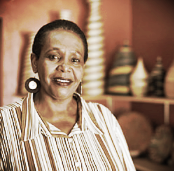 2015 - Joy Ndungutse receives the prestigious Artisan Hero Award for 2015 from the Alliance for Artisan Enterprise, Aspen Global Health and Development, and The Aspen Institute.